Newly released set-top boxes need a little something extra to make them stand apart from the likes of Roku and Apple. Diamond Multimedia has decided to enter the game with the help of Android, breaking away from its typical PC-based audience with the release of the AMP1000. 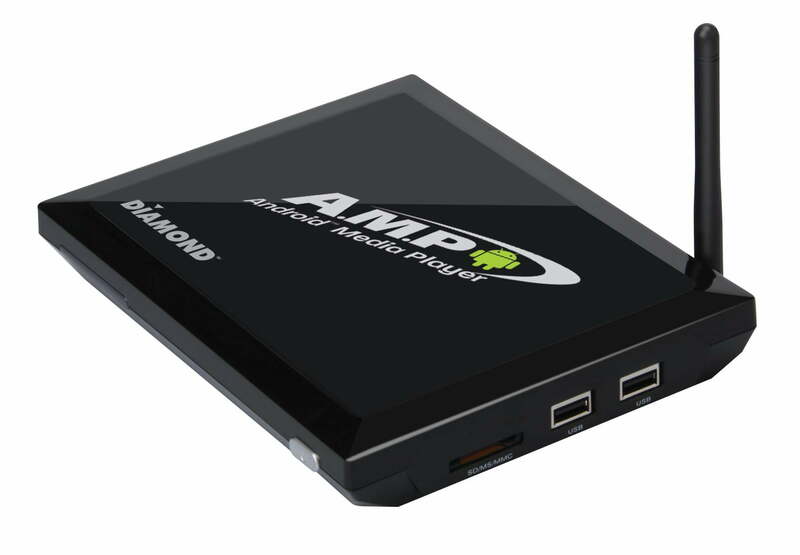 With built-in wireless and 1080P-quality streaming video, the AMP1000 (AMP stands for Android Media Player) also has access to the Google Play store. Instead of just being a streaming device for websites like Hulu, Youtube and Netflix, users can download and save their own music, movies and TV shows. It will also serve as a photo viewer, send email, browse the web, download games and apps – basically, anything an Android-powered phone or tablet will let you do — but on your television instead. The AMP1000 ships with the Gingerbread OS (version 2.34) but is fully upgradeable, and Diamond Multimedia contact Rita Tennyson said there will be an upgrade to 4.0 on their website in the near future. The 3-in-1 remote shipped with the AMP1000 works as a keyboard and mouse, and includes motion-controlled technology. Users are limited to just 3.5 GB of internal memory to start off with, which could be eaten up quickly by a couple of movies or TV shows. A built-in SD card slot doesn’t expand the memory, per se, but rather allows movable apps to be swapped from the internal memory. The AMP1000 runs on 512 MB of RAM, about the same as a Droid 2 by Motorola. At $120, the AMP1000 is competitively priced, but potential customers can visit Diamond Multimedia’s Facebook page and purchase the AMP1000 for a limited-time offer of $100. The AMP1000’s direct competition likely won’t be Roku or Apple, however. Earlier in August, Vizio released its Google TV box, the Co-Star, for $100 — that’s without a limited-time offer — which allows access to the Google Play store as well as on-demand video games from OnLive (though Onlive’s future seems uncertain at this point). Buyers may be inclined to go with the established name in entertainment instead of a company that focuses largely on graphics and sound cards for computers, but only time will tell.